Rediff.com » Movies » Review: Jumanji: Welcome to the Jungle is FUN! 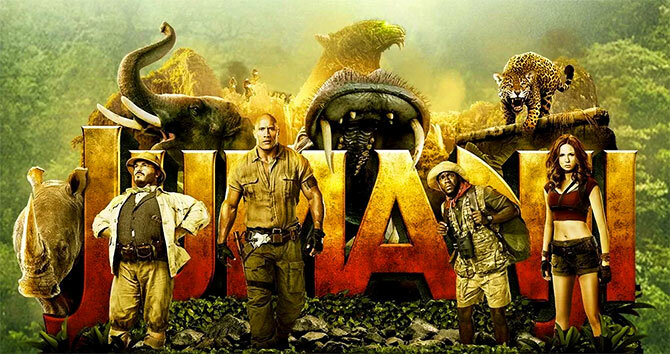 Review: Jumanji: Welcome to the Jungle is FUN! The new Jumanji can easily be enjoyed by those unfamiliar with the original, feels Sukanya Verma. Like any other 1990s kid, I lapped up Jumanji's destruction and adamant wildlife creating a relentless atmosphere of urgency and danger. Around this dark board game, played by kids and kids who look like grown-ups, the stakes felt high and events inspired novelty. Back then, the SFX boom was kicking in and its star Robin Williams not only had a ball with technology but also lent it heart and humour. These days though, given Hollywood's excessive dependency on CGI, devastation and cacophony has become a regular thing. As have reboots and sequels. I wasn't holding my breath for Jumanji 2, but Jake Kasdan's droll treatment and snappy rhythm, which prioritises the virtues of funnymen over the innovations of computer graphics, took me by surprise. Jumanji: Welcome to the Jungle is an old-fashioned follow-up to the 1995 success, yet not dictated by nostalgia. A few nods here, a few tokens there commemorate its memory, but the new Jumanji can easily be enjoyed by those unfamiliar with the original. In keeping with the title, all the action unfolds inside a jungle after four high school kids discover the titular game in its all-new multi-player console avatar. Thankfully, not much screen time is squandered on these bland adolescents facing standard teen issues. Once they are magically sucked into the game and acquire the personality of the characters they have chosen to role-play -- one that is completely opposed to their own -- Jumanji truly gets rolling. The shift is as dramatic as pumpkins turning into chariots. But what are life lessons in the absence of cinematic gimmicks? So the puny nerd transforms into Dwayne Johnson's brawny demigod, the Instagram obsessed prom queen prototype creeps into Jack Black's portly being, the self-absorbed dude becomes Kevin Hart's sidekick whereas the anti-social mouse morphs into Karen Gillan's Lara Croft aspirations. I am not much of a video gamer, but understand enough to appreciate its hilarious play on RPG landscapes and guidelines that mock and revel at, its obvious lack of depth. Jumanji's lightweight charm lies in its characters' duality. They're dumbstruck by their newfound abilities (and bodies) while comically discovering their potential as players (and grown ups with juvenile impulses) contending in an action adventure provisioned with limited lifelines, preset goals and quickly progressing arcs. There are times when the immersive 3D of the IMAX screen brings you uncomfortably close to the black mambas, albino rhinos and jaguars to give a sense of the danger they keep running into every corner. Except Jumanji never takes its survive-by-the-second scenario seriously. Nor does it appear the slightest bit apologetic when resorting to silly tropes and clichés. Its sole purpose is to please, a target that is duly fulfilled by its handful of comedians who elevate Jumanji's run-of-the-mill routine to waggish fun. There's a scene in Jumanji: Welcome to the Jungle where a character says, "This is Alan Parish's home, I am just living here."